20,000 Search and Rescue calls, with over 3,000 lives saved, every year. The United States Coast Guard, under the Department of Homeland Security since 2001, has been operating to secure our coasts and protect our citizens since 1790. All Coast Guard “Rates” (Specialties) support Search and Rescue in some way. At the Ready spoke with Commander Mark Turner, Chief of the Coast Guard Office of Search and Rescue Policy Division, about one of the oldest and the most visible missions of the Coast Guard. When the Coast Guard gets a call, often the only information known is that people are in distress, with no further details. With sometimes extreme distances between the crew and the call, the USCG SAR teams do not always know what situation awaits them. All calls are treated as actual emergency cases unless proven otherwise, and responses are made while the Rescue Coordination Center attempts to validate as much information as possible. Often aircraft, such as the USCG Helicopters, respond “blind” due to space concerns, without much info, and do not always fly with medical personnel. The Coast Guard is alerted to a distress situation through several methods, not all of them equally effective. In the vast ocean, pinpointing the location of the vessel or persons in distress, where there are no cross streets or landmarks, is a challenge. Recognized international distress signals, such as red flares or use of the 406 Mhz beacon, will alert others that a boater is in distress. The 406MHz beacon works through the internationally recognized distress alerting Cospas-Sarsat system, and when activated sends a signal via a satellite to a ground station to coordinate SAR response. Not all watercraft are required to carry the 406 MHz beacon, but persons who have them must register the device with a unique identifier. Please visit http://www.sarsat.noaa.gov/beacon.html for the regulations regarding the use of the 406 beacon, and to register a device with a unique identifier. Use of this device pinpoints a location for responders and can save valuable time in the response to the SAR case. A Marine VHF radio has a range of approximately 21 nautical miles and permits Coast Guard Rescue Coordination Centers to communicate with the vessel in distress to gather critical information about the nature of the call and the resources that will be required. Channel 16 is the recognized International Distress, Safety and Calling channel, and is monitored by the USCG. For procedures using this communication tool, including proper radio traffic format, visit http://www.navcen.uscg.gov/?pageName=mtBoater For a list of the Marine VHF frequencies, and their uses, visit http://www.navcen.uscg.gov/?pageName=mtvhf If you plan to be near or outside the range of 21 miles offshore, the USCG strongly recommends another type of location device along with the radio. The least reliable alert is a 911 call on a cell phone, which must be forwarded to the Coast Guard from the local 911 dispatch. The cell phone call is not a recognized international distress call, and cell phone coverage may be inadequate offshore. The 406 MHz beacon and the Maritime VHF Radio tuned to channel 16 are the preferred communication methods and should be onboard with you if you venture out to sea. 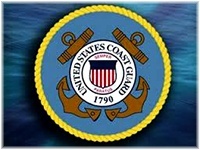 The Coast Guard strongly advises against relying on cell phone only. The types of incidents that require Coast Guard assistance may surprise you. Along with the lonely fishing or pleasure boat, the USCG responds to cruise ships, cliff rescues, and the beach line in remote locations. The team may be required to fly to a remote Alaskan village to assist in the delivery of a baby, or effect rescue of personnel caught in a CAT IV hurricane, using their highly skilled rescue swimmers. When responding to cruise ship medical emergencies, often the nurses or medics who serve on the lines will accompany the USCG to the hospital. For known medical emergencies in cliff or beach areas, with no local medic on scene, the USCG co-located with a medical unit may fly with a Corpsman, and each crew knows the capability and limitations for each of the regional hospitals. After rescue, the team will fly the victim to the appropriate facility.